A stunning converted former stable block with original oak beams and a vaulted first floor ceiling with oak joinery throughout. Top quality contemporary soft furnishings and quality solid oak furniture. 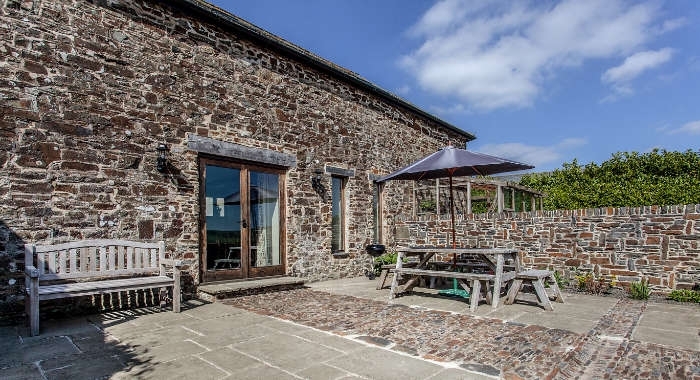 Formerly the stable block that housed the three horses that worked the farm prior to the arrival of the first tractors, The Old Stables sits within the farmstead and benefits from glorious country views and a private sun trap terrace. The stable block, was completely rebuilt using original materials and nestles under a natural slate roof. The accommodation on the ground floor comprises a large open plan living space, a dining area and kitchen/breakfast area. A separate WC is located off the main living area. The ground floor benefits from underfloor heating throughout. A widescreen television, with separate DVD player, complements the main seating area. The first floor, accessed by an open tread oak staircase, comprises three bedrooms, two with ensuite bathrooms (with powerful showers over the baths) and one with an ensuite shower room. All have washbasins and WCs. One bedroom upstairs has a double bed with the others having the flexibility of zip and link type beds allowing for two singles or a double to suit. The kitchen is equipped with a large electric range cooker, American style fridge/freezer with water dispenser, dishwasher and microwave. Outside there is a large fenced terrace with a seating area and barbeque. Leisure facilities: shared heated indoor 13 metre swimming pool and sauna, extensive farm walks, croquet lawn, private fishing and clay pigeon shooting, wildlife safaris and camera deer stalking. Farm activities: we’re always delighted when our guests want to help feed the chickens and help to collect eggs and feed other livestock under supervision. Amenities: adjacent parking for up to two cars, bed linen, towels, electric and central heating. Wi-Fi broadband access is available free of charge and there is good mobile telephone reception for all major operators. There is an on-site coin operated laundry and drying room. Regrettably we are unable to accept pets. The Old Stables is a no smoking building.